In the months preceding our departure to Central America, Laura talked incessantly about wanting to see Guatemala’s national bird the Resplendent Quetzal. Not being as passionate of a birder as she, I didn’t initially share her enthusiasm. However, the more I read, the more I became intrigued. Approximately the size a Macaw, the Resplendent Quetzal has a vivid scarlet red chest, with gorgeous bright green feathers covering its head, wings and three foot long tail (male). The Quetzal is such an extraordinary looking bird that western biologists thought they were a myth until they were first scientifically documented in the 1940’s. Once plentiful during the Mayan period the bird was considered sacred and killing it was a capital offense. Unfortunately, today it has nearly disappeared from Central America’s cloud forests due to habitat loss. By the time we had reached Guatemala, both of us were eager yet skeptical about our chances of seeing this purportedly rare bird. While there were several pockets of Quetzal populations scattered about the country, nearly everything we read lamented the near impossibility of actually spotting one. Not to be dejected, we set out for the logical beginning to our search, the Biotopo del Quetzal. The park was established by Mario Dary Rivera in 1977. A dedicated conservationist and educator, he worked tirelessly and successfully to convince a military controlled dictatorship in the height of a civil war to preserve habitat for the Quetzal bird. Rivera, then director of the Universidad del San Carlos de Guatemala, was assassinated four years later for speaking out against drug dealers presence on campus. While most travelers wiz past the Biotopo on tourist shuttles heading from Guatemala City to Semuc Champey, we unload our bags in the light rain several hundred yards from the park’s entrance. The drive there had been a bit deflating. Anxiously awaiting our first view of the dense jungles and cloud forests of Guatemala we were saddened watching mile upon mile of scarred, bare hillside pass outside our window. As the shuttle climbed, the clouds hung lower and lower on the surrounding mountains. Soon it was raining and the first glimpse of the Biotopo from our cramped shuttle’s windows was filled with dense green foliage distorted with thick mist. This mist is created when warm Caribbean air passes over Lake Isabel in southeastern Guatemala. As the warm air is thrust up the mountains near the city of Coban it cools, shrouding the hills in clouds and producing a massive amount of precipitation. This perpetual rain has created one of the most biologically diverse ecosystems in the world. The hills are covered with lush vegetative life – each towering tree is home to thousands more plants and animals which never touch the ground. Tucked in between the park’s borders and the highway was our accommodation for the night. We were the only guests at the Parque Ecologico Gucumatz, a simple Guatemalan owned hostel with breathtaking grounds and friendly service. After a quick and delicious typico lunch, we headed to the park for an afternoon trek. Entering the park, one of the workers asked us if we were there to see the Quetzal bird. The remainder of the conversation was a bit unclear as our Spanish skills at the time were still a bit lacking, but we chuckled on our way up the trail thinking he had just assured us the Quetzal birds would be there at four o’clock. The trekking that afternoon was incredible. It was our first time in the cloud forest, and for two people from northern seasonal environments, the lushness and diversity was absolutely captivating. Though the hiking trails wind their way through only a small portion of the park (the remainder is kept untouched by humans), they provide a fascinating glimpse of an ecosystem that is quickly disappearing from the Central American landscape. This becomes heartbreakingly apparent when the thick forest gives way to a rocky lookout. We were aghast by the panorama of the hills before us. Each of the mutilated, bare mountains is bandaged in a thick layer of black plastic sheeting. These are fern farms. The cloud forests produce ferns in amazing quantity. But unfortunately, they’re surrounded by a bunch of pesky trees. The solution, of course, is to clear-cut and burn the mountain. The only problem is ferns need shade, hence, the need for plastic sheeting. What is the ultimate purpose of cutting down the world’s most biodiverse forest to produce fern (which it already creates)? To decorate Westerner’s flower bouquets. The ferns that are inevitably wrapped with every dozen roses, daisies, ect comes from this process. Perhaps, consider telling your florist thanks but no thanks on the fern next time. To think that something as invaluable as this forest could be destroyed for something so unnecessary is appalling. Although this stark reminder was difficult to take in, the remaining miles of forest restored our good mood. One strong individual had stepped forward and saved this magical stretch of land and it was a good start. Though we hadn’t spotted a Quetzal on our trek, we walked towards the exit content. Upon encountering the park employee on our way out we enquired about the location of the Quetzal birds. After several minutes of misinterpreted and miscommunicated Spanish, he convinced us to leave the park and walk down into the parking lot. He wasn’t shooing us away. It took him less than a minute to point out a bright, gorgeous, large male Quetzal bird perched in plain sight. After several minutes of watching the bird sit suspiciously still, Laura started betting money the ‘fake’ bird was a decoy to get disappointed tourists out of the park by closing time. Then it flew for another Agucate fruit. 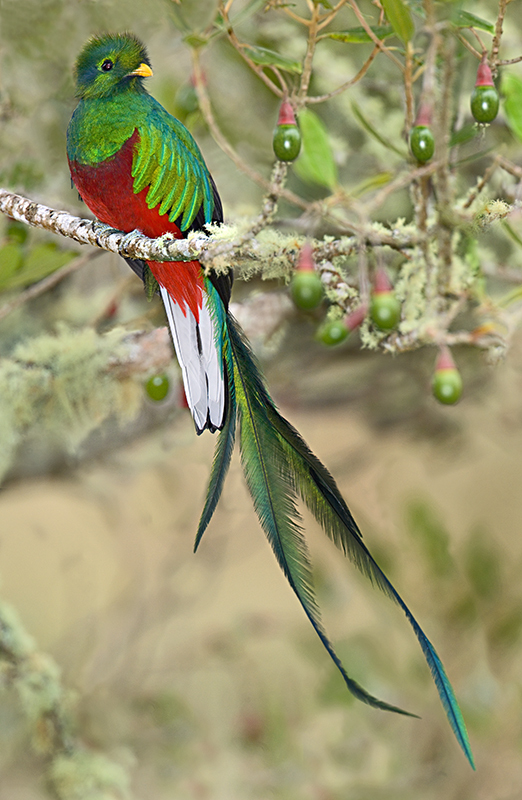 To our knowledge, the Quetzal birds are regular feeders on the Agucate trees lining the Biotopo’s parking lot. Morning feeding is 7am and they return around 4pm for dinner before their songs break the dense forest at dusk. Mario Dary Rivera himself planted these trees as a decoy to get the Quetzal birds in a place where their majesty can be easily viewed by interested and appreciative tourists. We spent the next half hour in awe as we watched three quetzals gracefully enjoy their Agucates and play with one another. Their meal through, we watched in silence as the quetzals disappeared like apparitions into the foggy laced woods. We would join them again the next morning for their breakfast. While the Quetzal is, despite rumors to the contrary, quite easy to see at the Biotopo del Quetzal, it has largely disappeared from the Guatemalan landscape and its future preservation within the park is by no means certain. While it is a true gift for a backpacker to discover a park or wilderness hardly touched by the tourist highway, it is the presence of inquisitive and responsible visitors that is going to keep Mario Dary Rivera’s dream alive. If you are interested in visiting the Biotopo, any bus our shuttle travelling from Antigua and Guatemala City to Coban or Lanquin can drop you off at the park’s entrance. Just past the entrance is the Parque Ecologico Gucumatz (5368-6397). To depart, wait along the road for a passing bus or shuttle to Coban, which offers connections to the rest of the country. Perhaps the most intriguing account of the Quetzal’s plight is Jonathon Maslow’s Bird of Life, Bird of Death, which cataloged his quest to find Guatemala’s fading national symbol during the height of its bloody civil war. *Disclaimer: To our utmost disappointment our camera was lost shortly after our visit to the Biotopo. The pictures on this post are borrowed or were taken in other cloud forests we visited in Central America.